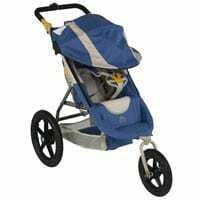 Kelty has recalled the single jogging stroller Kelty Swivel Deluxe and the double jogging stroller Kelty Swivel Deuce. The front wheels on the product can come loose and cause the stroller to tip over which may lead to injuries of both children and adults during use. The recall includes over 3,000 units; Kelty Swivel Deluxe with model numbers 20090116(B), 20650411BLU or CU, and Kelty Swivel Deuce with model numbers 20090216 and 20650611. The strollers have an aluminum frame and a cloth seat with a canopy. They were sold in color combinations of blue/gray and orange/gray. The recalled strollers were sold at children product and sporting goods stores from January 2010 until February 2012 for between $375 and $475. Consumers are strongly advised to stop using the recalled strollers immediately and contact Kelty for free updated assembly and maintenance instructions at www.kelty.com.